You barely have to lift a finger. We'll come to you. Come check out our beautiful boutique, and say hello. Your garments are photographed, and meticulously detailed (piece by piece) into our system. We deliver directly to your door, or doorman. Bridge Cleaners & Tailors has been family-owned and trusted by thousands since 1968. We proudly serve our wonderful neighbors, growing families, fashion boutiques, and corporate partners with the finest in garment care and expert tailoring. Keeping our clients looking their best, and treating them in the best way we know how is what we love to do. We hold ourselves and work-family to the highest standards in quality and service, all while making life more convenient for you. Combining modern day technology with generations of cleaning techniques and secrets - there is no one better to trust with your finest things. 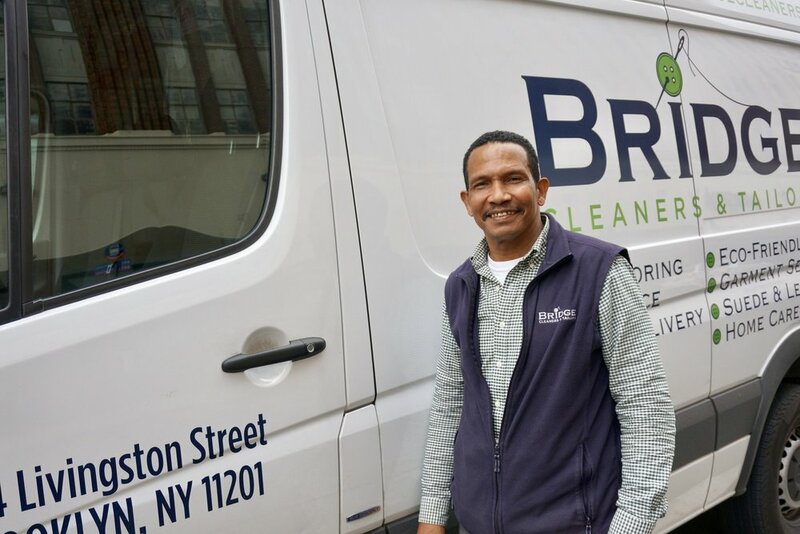 Our boutique in located in the heart of Downtown Brooklyn, and our own state-of-the-art cleaning facility is located in the Brooklyn Navy Yard. We do not clean for any other cleaners, or do wholesale work. We focus all our time and effort on you. To learn a little more about our history, click here. Questions, Comments, Special Requests, Cries of Disapproval? We are here to listen to it all. We will get back to you, and quickly. Thank for you taking a moment to reach out. Also, click here to view our Price List. Click here to leave a few words. If you would prefer a call back, please leave your phone number. Thank you. Someone will reach out to you very shortly. We are always looking for like-minded individuals who really love taking care of others, and working with the coolest people around to join us. It's important to know that Bridge Cleaners & Tailors isn't like other companies. We are a family, that just so happens to deliver the finest in garment care, great service, and convenience to our amazing clients. Feel free to stop by, say hello to any of us, and drop off a resume.